Have you ever wanted to become like one of the celebrity chefs you religiously follow on TV (and elsewhere you can find them)? I know I would give an arm and a leg to be like Nigella Lawson – for more reasons than her cooking, obviously. I’d also sell my most precious gadget to be like Jamie Oliver. Or, rather, be with Jamie Oliver – but that’s a totally different story. All kidding aside, I think that every home cook has this inner desire to meet the standards of their celebrity chef of choice. That is perhaps one of the biggest reasons that this obsession about celebrity chefs (and everything associated with them) has taken a stronghold in society. While not all of us may be as talented as Gordon Ramsey, I do believe that a little ingenuity and sense of adventure can take our cooking to a whole new level. All that we need is a push and some help. That’s where this new recipe search engine can come in very handy. It’s called Recipe Finder, and it does what the name says – finds recipes for you. 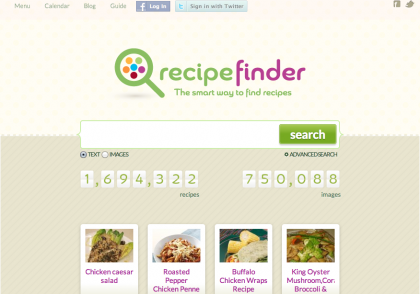 Recipe Finder is a search engine that was built with the average user in mind. That means that practically anyone can use it to find recipes that can be made in any kitchen. 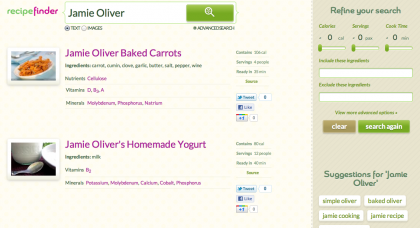 One of the great things about Recipe Finder is its simplicity. Here’s a peek at what awaits you. As you can see, you have the search bar which you can find in most search engines, and you simply have to enter the recipe name or ingredients and you’ll get countless options as results. With almost 1.7 million recipes in their database, I am pretty sure that you will have your hands full for a long, long time! 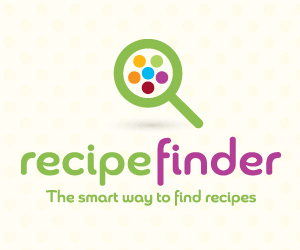 Now for a very important question: Can Recipe Finder help you cook the dishes your celebrity chef of choice makes on TV? Take a look at this. My Jamie Oliver query did not disappoint! Those are only the first two results, obviously, and scrolling down will give lots more to drool over. Those results are displayed using the text option, but there is another option, which will tempt even the most disciplined of people. What did I tell you? 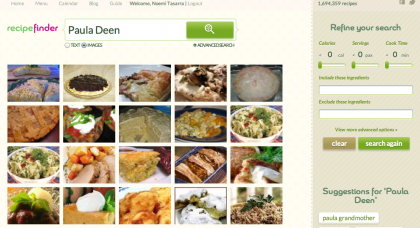 A search for Paula Deen’s recipes using the image view is simply delightful! You can, of course, view the recipe itself by clicking on an image. 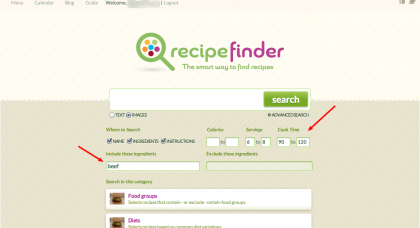 Recipe Finder also allows you to narrow down your searches using advanced parameters. You can specify ingredients to include or exclude, the number of servings, the amount of calories, and the cook time. All you need to do is click on the Advanced Search link, which can be found below the search bar, at the right. Imagine this. You get a call from your husband (or wife, as the case may be). He just got promoted and he wants to celebrate with a nice dinner and that he’s bringing his boss over, together with some colleagues. There will be 5 of them. Before you panic, think about this. Maybe you’ve got beef. You have about 3 hours to prepare. Go to Recipe Finder and do this search. You’ll get plenty of results that will make you look like you were a born home entertainer. A main course using beef as the main ingredient, good for 6 to 8 people, and made in 1.5 to 2 hours – easypeasy with Recipe Finder! Not only do you get to celebrate your husband’s promotion, but you also seal your reputation as a wonderful cook. You may not have your own cooking show, but you can always pretend to be on air while preparing those delectable dishes in your kitchen! Doesn’t the thought just excite you?